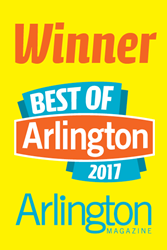 Moss Home Services was voted Best Handyman in Arlington Magazine's 2017 'Best of Arlington' issue. Moss Building and Design is the reigning Best Remodeler as well as a top vote getter in the Best Kitchen & Bath Design category. Moss Home Services is proud to announce Arlington Magazine has named them the ‘Best Handyman’ in their 2017 ‘Best Of’ issue. The magazine, which publishes their ‘Best Of Arlington’ list each year, encompasses a wide range of businesses. In addition to this award, Moss Building and Design was a top vote getter in the Best Kitchen & Bath Design Category, and is the reigning Best Remodeler.